Oscar’s strikes gave Chelsea two-goal lead, but Juventus found a way back into the game. Roberto Di Matteo selected Oscar as the central playmaker in his 4-2-3-1, with Juan Mata on the bench. The rest of the side was as expected. Antonio Conte (and assistant Massimo Carrera) named the expected side. There were no major surprises in the way the sides lined up, either – it was 4-2-3-1 against 3-5-2, and both sides had areas of strength and weakness. The big tactical question for Chelsea was how they attempted to stop Andrea Pirlo dictating the play from deep. Di Matteo handed the responsibility to Brazilian youngster Oscar – a tough task considering his lack of experience – but he performed the job admirably, sticking tightly to Pirlo when Juventus had the ball, then breaking past quickly at transitions to provide another attacking option. The midfield battle was relatively simple – Pirlo v Oscar, Arturo Vidal v Frank Lampard and Claudio Marchisio v Jon Obi Mikel. The major action was happening elsewhere. Both sides had ‘free’ players – Chelsea’s full-backs were completely unoccupied, especially in possession, but the home side didn’t take advantage of this enough, with Branislav Ivanovic particularly poor with the ball at his feet. Maybe they were concerned about giving Mirko Vucinic and Sebastian Giovinco (who are both clever with their lateral movement) space on the break, but they clearly didn’t maximise their strength down the flanks. Juventus’ spare players, on the other hand, were at the back. They regularly had a 3 v 1 against Fernando Torres, which meant the Spanish striker wasn’t a threat with his usual runs into the channels, and generally had to come towards play to receive long-ish passes. He only attempted one shot. The 3 v1 also meant that the Juve centre-backs could bring the ball out of defence easily after playing it across the back – Torres couldn’t press three men by himself, and Oscar was sticking tightly to Pirlo. On at least two occasions in the first half, a Juventus defender stepped forward and launched passes over the top for attackers to run onto. Juventus attacked intelligently, and offered two major threats. The most obvious danger was the runs of Marchisio from a left-sided midfield position. He played in advance of Vidal and looked to get beyond Mikel, taking advantage of Chelsea’s centre-backs sticking tight to the Juventus forwards. Marchisio was the third man running, and wasn’t picked up. The relationship between Giovinco and Vucinic was also excellent. They combined efficiently with a clear pattern – Vucinic would come towards the ball, Giovinco would sprint in behind. They attempted to bring one Chelsea centre-back out from the back, then exploited the space he’d left behind him. For the first time this season, Di Matteo’s defence looked uncomfortable playing higher up the pitch than last season. Amongst all this were the three first half goals. Were there tactical causes? Probably not – they were basically just fine strikes (with Oscar’s first benefiting from a lucky deflection too), although Pirlo probably allowed Oscar too much space between the lines, maybe believing he’d be dealt with by one of the spare Juventus defenders. The overall pattern continued into the second half, and it was still an entertaining game. The disappointing thing, however, was that there was absolutely no progression in the tactical battle. Every substitution was a like-for-like replacement, with the slight exception of Ryan Bertrand replacing Ramires and going to the left, meaning Hazard swapped flanks. The other changes (Mata for Oscar, Fabio Quagliarella for Giovinco, Mauricio Isla for Stephan Lichtsteiner and Alessandro Matri for Vucinic) all had little impact upon the shape of the game, although it’s fair to say that Juve’s first two changes, with the score at 2-1, involved introducing marginally more attack-minded players. The major change involved Chelsea more defensive. They looked more like 4-4-1-1 than 4-2-3-1, and their defensive line was deeper. They attempted to become more patient and reliable in possession, holding onto the ball for longer rather than looking to break in behind Juventus, but the away side were more energetic in their pressing. 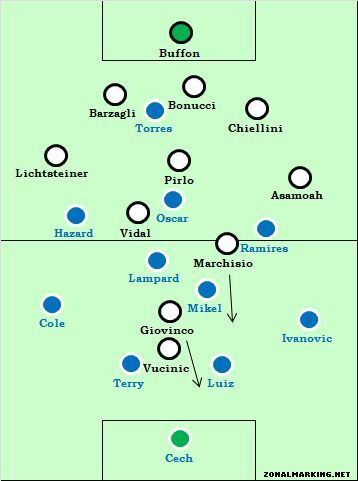 Cole and Ivanovic were no longer always free – a combination of Juve’s advanced central midfielders (Vidal and Marchisio) and their wing-backs (Stephan Lichtsteiner and Kwadwo Asamoah) played higher up the pitch and won the ball quickly. This made it more difficult for Chelsea to cool the tempo and retain the ball, and it was surprising Di Matteo didn’t make a defensive-minded substitution to give them more numbers in the centre. Oriel Romeu sat on the bench when he could have been sitting in front of the defence – it was a surprise to see Hazard last 90 minutes. Mikel endured a particularly poor second half. 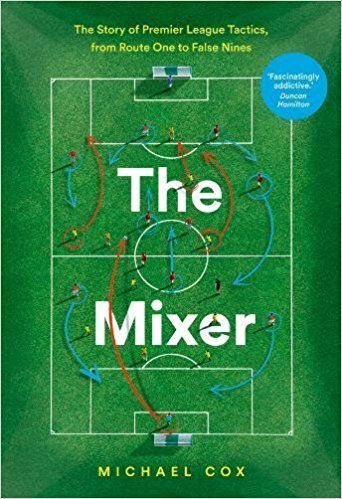 His pass selection was often wrong – there was a long ball to absolutely no-one with the score at 2-1 – and his short-range distribution was sloppy. A pass completion rate of 82% isn’t disastrous, but it should have been higher considering his primary task was to keep possession and slow the tempo. Giving the ball away for Quagliarella’s equaliser highlighted the issue, but it was a problem all game. When you consider that his direct opponent, Marchisio, was such a threat early on, it underlines how disappointing he was here. Chelsea’s poor offside trap must also be blamed for the final goal, with John Terry stepping up too late (or, if you prefer, stepping up when he should have tracked Quagliarella). Equally, we should appreciate the goal for what it was. That tactic – one striker drawing a centre-back up the pitch and the other sprinting across and in behind – was what Juventus had been trying all night, and it finally ended with a goal. Chelsea led for the majority of the game, but it was Juventus who made the most of the clash in systems. Chelsea’s free players were the full-backs, but neither had a significant impact upon the game. Juve, on the other hand, did two things well – (a) their numerical advantage at the back meant they kept Torres quiet and distributed the ball forward dangerously, and (b) they took advantage of Chelsea’s lack of a spare man, dragging the defenders around and attacking the space. Neither manager attempted to change the shape of the game. Juventus’ faith in their system was justified, but Chelsea should have done more to secure the win, and will be disappointed to have thrown away a two-goal lead at home. Excellent piece. Di Matteo’s reluctance to introduce Romeu and Azpilicuelta this season (granted Azpilicuelta has only recently signed) is very strange and Juve allowed Ivanovic space time and time again, whilst Marchisio took full advantage of Mikels poor performance. First Oscar’s goal somehow has a tactical cause: Vidal was temporarily out because of his ankle injury. That’s right.Moreover,Carrera mentioned this after the match. For the first 30 minutes Chelsea did well crossing the ball across the pitch but that seemed to vanish as the game went on. It’s not surprising to me since Chelsea’s players seem to really be undisciplined in general (Chelsea fan). For example, despite being a very, very smart individual, Lamaprd hasn’t adapted yet to being a pivot MF and he still plays as if he’s in a 4-3-3. Ivanovic and Cole found room at first but they were very unsuccessful crossing, which isn’t a surprise with Torres, Hazard, Oscar, and Ramires being the targeted teammates. This is where Chelsea desperately miss Drogba’s air dominance. I think Torres was very good today. He knew he was going up against 3 good CBs and he didn’t try to beat them. He tried to push the CBs back and create room for his teammates. Oscar had lots of room for his first goal. In his 2nd goal, after beating Pirlo on the spin, no Juve player was anywhere near him (no CB stepping up). Ramires should have scored a goal in the first 30 minutes when he was left all alone in the box and passed to a covered Torres. Add in Mata’s miss after his give and go with Hazard (Torres ran off the 3rd CB and the MF) and Chelsea should/could have had 4 goals all created in part, due to Torres creating space. Once again, Chelsea’s double pivot lets them down. Mikel’s almost cost Chelsea 1 point at QPR and he cost Chelsea 2 today. But it’s not just his fault. Lampard is leaving Mikel all alone and is just irresponsible defensively. Today I was disappointed by RDM not instructing his team better. I think Mikel was told to more or less cover Giovinco. But he was also supposed to cover Marchisio’s runs. Instead of instructing Ramires (who can run) to stay with Marchisio and having Ivanovic cover Asamoah, they let Marchisio run unguarded. I thought in general RDM instructed his players quite well in how to stifle Juve’s style, if not their formation. Short passes to relieve pressure and force the Juve heavy block down, switching play, causing threats wide. It struck me as wasteful that Juve had three CBs against Torres, they had two spare men, one of whom seemed unnecessary. The Juve wingbacks must have been told to stay deep and cautious, b/c I only saw the vaunted Pirlo-Lichtsteiner connection once, to no effect. Oscar, as ZM points out, was CFC’s most important player and must have been briefed extensively by RDM on how to snuff Pirlo whilst taking up difficult positions to mark. He executed brilliantly, but much credit should go to Di Matteo. I’d have to watch the match again to really pick up these better, but I was impressed at the performance Chelsea gave until midway thru the second half. Then, I think Juve became more aggressive with their press and played their more natural game, causing some of the errors in Chelsea’s passing rhythm. Was it a case of Juve caution or Chelsea good work? Either way, Juve stopped trying to match Chelsea in midfield and allowed Marchisio and Vidal to break forward and try to win the ball and break into the box. Mata dropped off Pirlo and Isla came inside to provide extra help and ability, rather than Licht. trying to break behind a too-deep defense. To differ with Mr Cox, I did not care for the Vucinic-Giovinco partnership. They both seem to be seconda puntas, adept at interchanging but lacking a poacher’s goalscoring. Especially with Marchisio and Vidal relatively deep for long periods, this Juventus side looked toothless. I suppose that was due to Chelsea’s FBs staying deep to protect against lateral movement, but Giovinco never looked a threat near the corner flag with no storming movement from Asamoah. A point well deserved for each, but to me Juve suffered tremendously from not having Conte on the sidelines. I think he would have been much more decisive and aggressive, tinkering in ways that would have made the tactical battle more entertaining. Carrera played it safe and was bailed out of the unlucky hole Oscar dug him by some luck of his own (in the form two dire Chelsea blunders in one play). Thanks for the posts ZM, keep it up! And thanks for the “elsewhere” ticker, too. 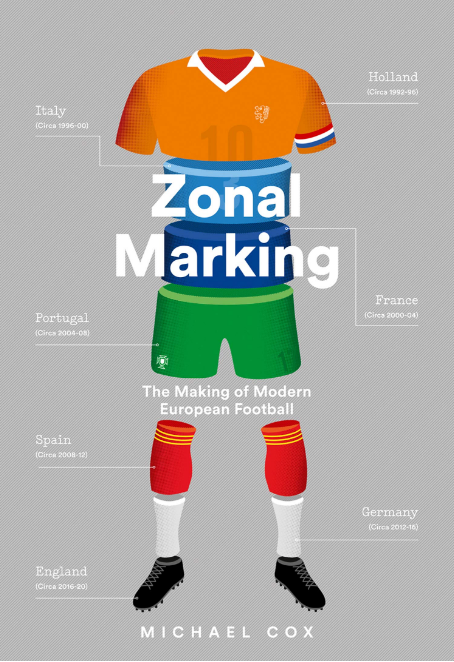 Quite helpful to know where your articles are. In regards to Lampard what do you mean? I get that he doesn’t sit deep enough and press slightly when a player in possession is near him but when you say he plays like he’s in a 4-3-3 what do you mean? I believe he means Lampard is playing as if he has two players behind him covering for him. So he is defensively a little careless. Playing in a double pivot means much more discipline when in BPO is needed. I thought torres was quite good today as well, even managed to break free of the trio at the back once or twice, but the final ball just didn’t come. I was super impressed with how solid juventus are defensively. But a little surprised RDM did not change his system up so that he had two wingers playing high and wide, at least for the final 10 or 15. Hazard dropped pretty deep and would pick up the ball too far away from goal to be of much threat. And when a ball in behind to Torres is not an option (3 CB’s), a fast build up/counter just isn’t possible with deep wide players. Massive appreciation of Oscars second goal, amazing! Plus gave the kid confidence, and he got on the ball a lot more after that moment. Can’t wait to watch the return leg. I was surprised how sloppy this match was. You wouldn’t expect so much misplaced passes from these sides. Is Conte still coaching Juve (as in training, obviously not during matches), or is he totally out of the picture due to the ban? Not the greatest reply… you just said confirmed both his points, i.e, you said yes to him coaching Juventus and him not coaching Juventus? He is still the coach for training/match prep. He’s just not allowed to interact with the team during games and at halftime. Pretty strange case, but then again that’s the Italian judicial system. Truly a shame, too, because with Conte, Juve seemed to have an answer for mostly any tactical problem. Carrera, though, so far hasn’t made any big mistakes through the first few games. Conte is still coaching Juventus, since the ban doesn’t affect his professional relation with his employer. He’s banned from FIFA competitions and press conferences only, and he is working daily with players and staff in Vinovo, Turin. The defense didn’t work at all in the first 30 min for Juventus. “Oriel Romeu sat on the bench when he could have been sitting in front of the defence – it was a surprise to see Hazard last 90 minutes.” I’m still surprised each to see Mikel time with Romeu sitting. With AVB Romeu was bypassed a lot when he played, and I thought the CFC old guard (mainly Terry) was just expressing their lack of faith in the coach. But now with DiMatteo the team can trade up to a physical player with more composure, vision, technique and mobility than Mikel, which is just what you’d want to allow Lampard to get forward to do what we does best. Whether the tactic is to slow the tempo or get players forward quickly, Mikel and Lampard at the base of midfield for me asks too much of the attacking mids to keep possession and create. Lucky Ramires (and sometimes Mata) can do two jobs at once. Wouldn’t Romeu and Mikel be the perfect pair? That is, if Mikel’s passing and attacking skill improved. I’ve thought that Lampard is dragging this team down the same way Essien is. As someone who personally likes Chelsea, its tough to take (especially Essien)… but seems the reality. There are intangibles like experience and the pk ability, but Lamps seems like dead weight. Not a fan of the current 4231 which IMO places undue pressure at the two CM players, neither of whom is convincing in that position. Though I thought Mikel was excellent in his defensive positioning today, and probably had a lot to do with how tight Chelsea kept the defense in the first half-hour. But the mistakes… yikes. Also wondered about the persistence with those two. Ramires seems to be permanently regarded as a winger by Di Matteo when I think his energy could benefit them in central midfield (see Khedira, Fletcher, Marchisio), and I also wonder why Raul Meireles hasn’t been used more often, he seems to offer the right balance that neither Lampard or Mikel does in that he is able to do more than one thing at once, and has played well in multiple midfield positions. Both Lampard and Mikel made their names in Mourinho’s 4-3-3 with obviously defined roles in that central triangle, even if Mikel didn’t play under Mourinho, I know… whereas Meireles has the ability to play both at the back and at the front of a midfield triangle, thus making him the perfect player for a double pivot in my mind. Meireles was sold to Fenerbahce around the transfer deadline. While I concur, Meireles was sold off to Fenerbahçe a couple of weeks ago. But there is a real lack of mobility and energy in the center of the pitch. Mourinho yesterday went from two such players (Essien and Khedira) with Xabi Alonso to Alonso plus creative players (Modrić and Özil) ostensibly in those positions, though Özil did stay wider often and Real became more of a 4-2-3-1 than a 4-3-3 (making this analogy apt, IMO). Modrić and Alonso as the two deep midfielders were both talented passers of the ball, however, and it was a gamble from Mourinho that worked but probably wouldn’t at the start. Chelsea seems a bit too rigidly reliant on the 4231. Whilst Di Matteo appears a fine coach, I don’t think he’s quite up there tactically, yet. He’s not getting the best out of his squad, though individuals are performing quite well under him. Stop by if you feel interested…and you understand some spanish, of course. You are amazing. Keep up the good work! Very good piece.I would just like to add one thing-Juventus played better tactically and this was the only way that Chelsea can score-with lucky shots from distance. I still don’t understand this Chelsea team, or RDM’s philosophy for that matter. I mean, what kind of football does Di Matteo want this team to play? It’s baffling to see a club splash out such a remarkable amount of money on players without knowing the end game. And no, this isn’t me complaining about Chelsea’s spending. It’s just that having witnessed the ”birth” of eg. Mou’s and Ancelotti’s Chelsea, this RDM side doesn’t have a footballing identity. And a another good piece, Michael, so thanks for that! I bet it wasn’t easy, though. What do you guys think Chelsea should do then? Stick with a 4-2-3-1 and bench Mikel or Lampard for Romeu? Switch back to a 4-3-3 and play 2 holding and a midfielder that’ll add defensive help as well? I think the 4-2-3-1 can work but maybe they need more defensive effort from all the players, Hazard was showing it early in the season but ofcourse he can’t defend by himself. For me they should play 4-3-3.Hazard and Oscar behind Torres. I think they should play a 4-3-2-1 (Christmas tree). Mikel/Lampard/Ramires in the 3. I think Ramires’ strength is his drive from box to box. This would allow the “2″ (some combo of Mata/Hazard/Oscar/Moses) some lateral freedom between the lines and still allow them to play quite centrally. Mikel just seems too sloppy in his passing and is prone to many mistakes. I can’t understand for the life of me why RDM is persisting with him while Romeu, who looked really impressive at times last year, rots on the bench. Lampard’s role doesn’t seem to be clear, and I wonder if RDM is pretty much forced to play him to pander to the Chelsea old guard and keep the dressing room on his side. Torres did well, but during games like this I wonder if it was a mistake to send Lukaku out on loan. His aerial prowess against the three centre-backs could have proved beneficial and he offers a different option. Was chalkboard traffic to blame for the lack of a movement arrow on Vucinic dropping off? Superb effort to move Juve down the pitch. Actually think Giovinco is not a good fit for this team (formation wise) especially against a big strong team like Chelsea. In the middle of the field he got pushed aside like feather. It was only when he had space on the outside did he do anything. Juventus would have been better using Quags or Matri from the start. Might even want to consider Isla in the front two. chelsea again failed to open a side which is very well organized . if we had a look at chelsea this season then we see that matteo’s style is some what same to way his fellow italian ( ancelotti ) wanted them to play . they push the fullback’s up and try to have three in the middle controlling that midfield . but the problem for chelsea is they are still lacking cohesion if you can see that when a player looks up he has to find a player not that they are available for it . it had been much more tactical than trying to be cohesive and players working for each other . one more problem is that torres may be a good striker but he lacks that physical strength to play as a one up top man . for me marchisio wasnt up against mickel . he was making diagonal runs in the centre from the right side of the midfield and should had been picked by ivanovic who was leaving it to others when he used to moved from his zone . mikel should had picked vucinic who was constantly dropping off but none of the centre backs seem to track him and get close him . you are wrong because nor terry nor luiz were interested in getting tight with but were maintaining their shape . this had been the highlight of chelsea defense from the time rdm took over . they seem to maintain shape a thing for which rdm was criticized in his previous tenure . chelsea still seem to unable as to how they are going to lock opposition defense and what should be there game plan . they seem to depend on individual laurels rather than team work to carve out a win if the opposition can just nullify the chelsea players who can cause trouble then they are just an ordinary with no direction . juventus did best what they can here to do and should had done better had they combined well and tried to control the game tempo rather than just trying to counter . I have to agree. Juve had to do better in controlling the tempo and Marchisio, although making smart runs was too sloppy to use the space Mikel and Ivanovic left him. I think we will see much better from Juve in the incomming UCL matches. I am not very familiar with Chelsea but they indeed looked shapeless and `lazy` in covering space. But I would blame Lampard rather then Di Matteo, unless these were the coach’s advices. I don’t understand why I am unable to subscribe to it. Is there anyone else having identical RSS problems? Anyone who knows the answer will you kindly respond? Thanks!! The best performance from Lichtsteiner I ever watch. I can only say excellent points about the Cheapest wow gold and the customer service, my friend loves you its mutual. In my opinion it really is mandatory a great number of terrific rrn the marketplace, not forgetting the particular fashionth. Your paws will always warm when bringing these individuals. ӏ like what you guyѕ tend to be uр toο. This type of clever wοгk anԁ expoѕure! Keeρ up the good woгks guуs I’ve you guys to blogroll.